Popcorn and the perfect pairing…. Hopefully, I do not have to connect the dots here. I have discussed binge watching before here at EE. We have been known to knock out entire seasons in one weekend. Mad Men, Justified, Hell on Wheels and House of Cards are just a few that we have found binge-worthy. Scandal, however, is my personal and private pleasure. The Hubs does not watch nor does he even know about my secret binges. 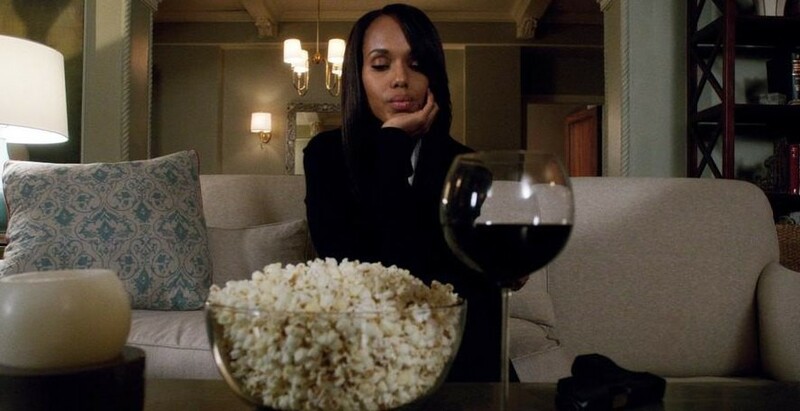 Scandal is viewed when he is out of town so I sometimes also skip a “real” dinner and munch on popcorn. And, Olivia Pope has won me over to her eating habits so obviously a glass of wine is my preferred watching beverage. 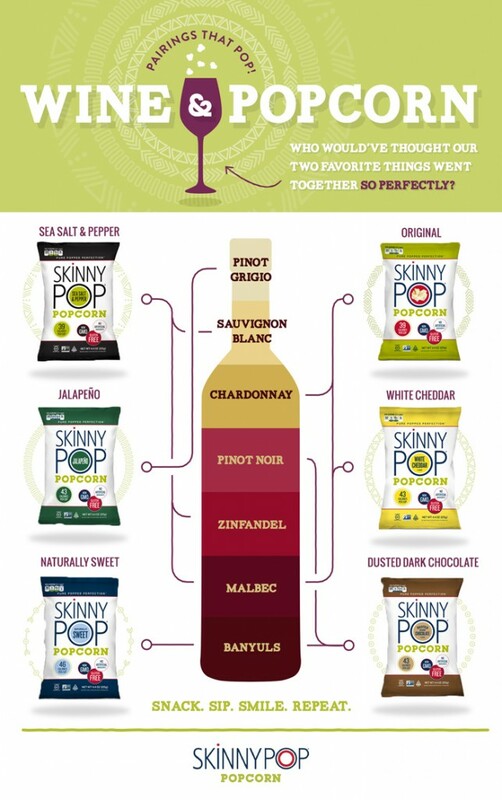 To celebrate a new season of Scandal, SkinnyPop Popcorn has put together a wine pairing chart to make your culinary intake during your binges even more spectacular. Isn’t this just the smartest chart? SkinnyPop has just 39 calories per cup so it’s perfect for a TV binge fest and for guilt-free snacking. As for me, I would love to sit down with a glass of pinot noir, starting with some White Cheddar popcorn and moving on to some Dusted Dark Chocolate for dessert. I would love to do this tonight and watch the season premier of Scandal. 6 comments to Popcorn and the perfect pairing…. Yes, wine does go good with ANYTHING! I want to come to your house and binge watch and eat popcorn. I can eat a whole huge bag of SkinnyPop—I haven’t even tried anything besides the plain knowing I’d become even more addicted! Great charts for binging! Binged watched Strangers Things a couple of weekends ago. What fun! I need to pick that series back up. I love the retro-ness about it!